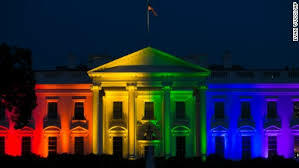 Regarding the Supreme Court ruling that made gay “marriage” the law in all 50 states…..
Donald Trump said that he would “strongly consider” appointing Supreme Court justices that would overturn last year’s ruling. Ted Cruz said of the ruling, “I think the decision was fundamentally illegitimate, it was lawless, it was not based on the Constitution.” Cruz later added that states should ignore the ruling altogether. Y’all take that for what it’s worth. But remember that before he was elected, Obama told the American people exactly what kind of President he’d be and was true to his word about it. Words reveal character.